The Rhapsody cruised through the night after an amazing stop in Santorini, we woke up, docked in Pireas. Our excursion was set to leave early to get to the Acropolis first thing(we wondered why so early, we found out later on) so we ordered breakfast to our room and ate on our balcony before heading to the theater to meet our tour group. Pireas is the busiest port in Greece and is about a 25 minute ride from Athens and our first stop, the Acropolis. Along the way we passed several arenas and stadiums built for the 2004 Olympics, many of them seemingly unused. As the bus made it’s way through the streets, you notice the sad state of the Greek economy. There are several buildings that are crumbling, more that were being renovated and then abandoned mid project. Our tour guide spoke of the criticism around the Olympics and the cost, while they are still paying for all of the upgrades and buildings, they are very happy with the infrastructure improvements. Athens is home to 3 professional soccer clubs, as we passed Karaiskakis Stadium, home of Olympiacos FC(one of 3 soccer clubs that call Athens home), which was completely rebuilt for the 2004 Summer Games you could see the Acropolis in the distance. After snaking through the streets our bus arrived at the parking lot to the Acropolis. We made our way through the gate and ventured to the top. Today is the anniversary of Greek liberation from Nazi occupation so on our way up, we encountered a presidential guard procession coming down from raising the flag. Our guide brought us up through the Propylaea and you get this feeling being in something that is thousands of years old. Coming from a construction family, after the initial “holy crap I’m at the Acropolis” feeling wore off, I immediately thought about how they did all this without anything that resembled modern construction equipment. The tour guide was very long winded which didn’t leave us much time to explore and take photos of everything. There is a lot of work going on with the restoration process but the work they are doing is amazing. Many of the structures had been renovated before, but with concrete. Now, the crews are replacing the missing or damaged pieces with replicas from the same quarry that produced the originals. We walked around getting photos of the Parthenon, Erechtheion, Temple of Athena Nike and the Odeon of Herodes. Not to mention the view of Athens and surrounding areas from above. There were security guards with whistles blowing if you were too close to the edge or if you got to close to some of the pieces laying on the ground. It seemed like one constant whistle being blown. The people watching was also phenomenal, especially the dude in black short short shorts who I still believe was a pick pocket. As our time came to an end, we started the trek down to the tour bus. Remember what I said earlier about getting there early? Well, when we arrived, we walked up to the top, without stopping(except for the tour guide to point something out), on the way down, we were met with a long line of people waiting to get to the top. And this was roughly 10am. Due to the anniversary of the liberation from Nazi control, there were many school children in groups making the trip to the top, along with many more tourists. Back on the bus we ventured out for a city tour. 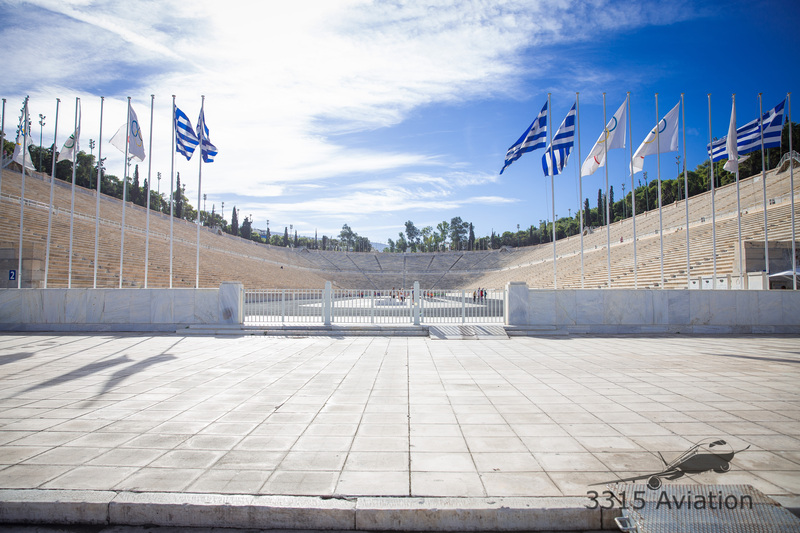 A quick photo op at the Panathenaic Stadium made me almost want to go run a lap around the track, but I wanted to survive the honeymoon without fear of a heart attack. I’m not entirely sure LifeFlight of Maine’s King Air would make it there to haul me home in under 4 days. Other sites included Temple of Olympian Zeus, Hellenic Parliament and Zappeion Gardens. 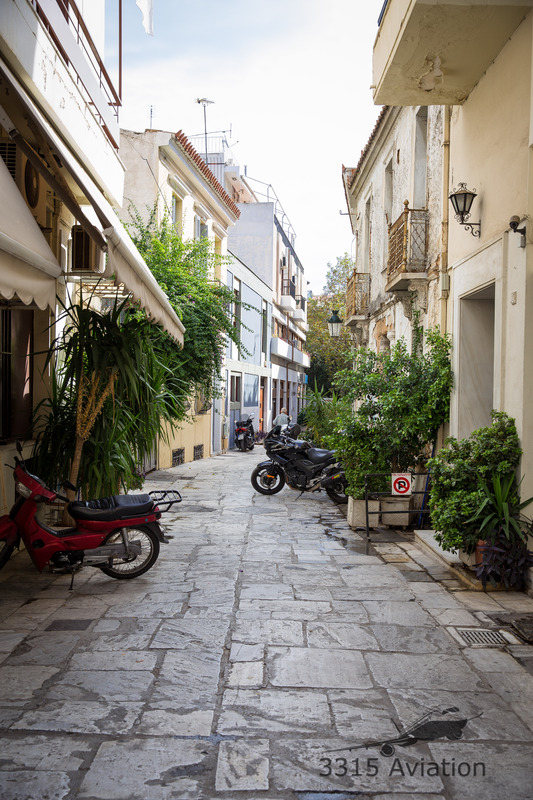 At the end of the city tour, we were dropped off in Plaka, the historic shopping district in Athens that looks up at the Acropolis. We made our way around to do some shopping for souvenirs for our family as well as a stop for some lunch. Gyros and a Mythos Beer were on the menu and again, if I could, I would’ve brought some Mythos back with me. Our tour included a bus back to the boat starting at 2:30. By 1:30 we were ready to roll. Sadly, as beautiful as Athens is, with the rich history, the economic turmoil has dealt it a major blow. The city, while clean in tourist areas, is in major despair elsewhere. Graffiti is seen everywhere, but no effort is made to remove it. This was also, by far the worst spot for panhandlers. Here, they just walk up and shove a hand or cup in your face and don’t back down, though, as with other stops, they weren’t native Greeks, rather, from Middle Eastern descent. 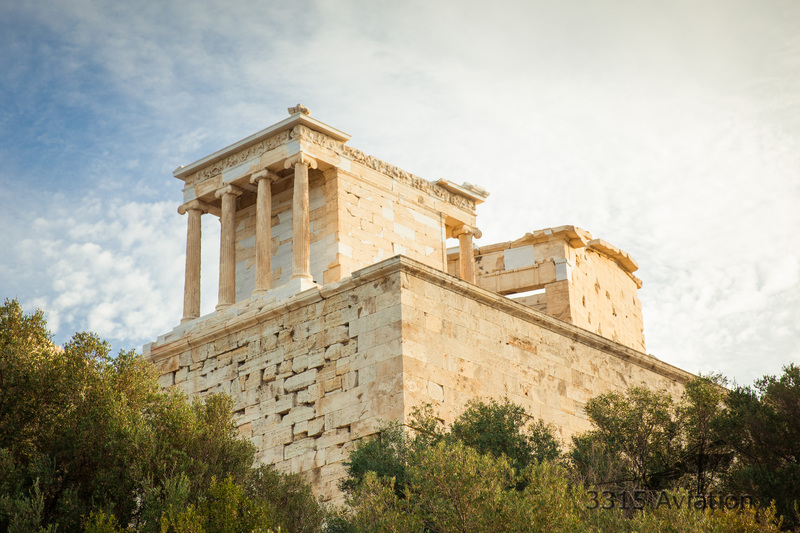 Ultimately, I can say that I’ve been to Athens, to the Acropolis and Panathenaic Stadium, and while I would love to explore these ancient sites more, I don’t think I would go back until things change with the financial system. Another note, and I think this is more of a Europe thing as a whole, there are A LOT of people in Athens that smoke. Coming from the US, where smoking is banned in restaurants and other public areas, it was overwhelming at times dealing with the 2nd hand smoke. After catching the bus back to the cruise port, we were greeted with something that we found rather odd, a security checkpoint for boarding the boat. When we arrived, we got off the boat and went directly to the bus. To get back on we went through the security checkpoint in the cruise port, as well as the checkpoint on the boat that Royal Caribbean has. We got back on board with plenty of time to relax before port, we were able to catch up on some rest. After dinner we caught a show in the theater, Gary Williams singing Rat Pack tunes. Time for bed. Mykonos, here we come.